A city entrepreneur has landed a lucrative contract to supply iron-on name-tags for school uniforms and shoes to supermarket giant Asda. 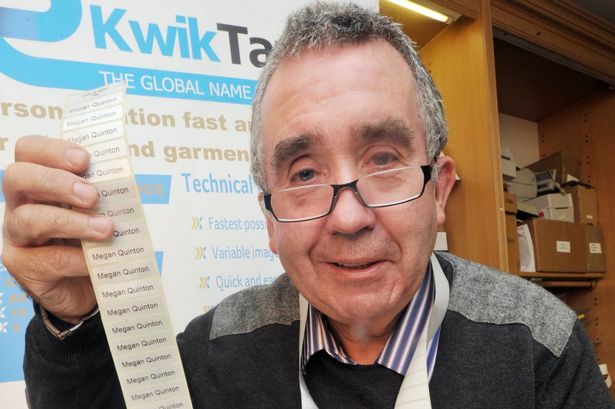 John Baines is the owner of Quicktapes on Pershore Road, Stirchley, Birmingham, who has made his millions from selling school name tags. Stirchley-based John Baines, founder of Kwiktapes, said the deal will help his business conquer the giant US market, with the supermarket chain being owned by American conglomerate Walmart. The supermarket began stocking his products this week and the 63-year-old said it was potentially worth millions of pounds. He also supplies British Home Stores and Marks and Spencer. He said: “I’m so proud, I’m like a peacock. I can’t think of one British company that sells to America, all the big stores have failed. Asda have just been on the phone, saying how chuffed they are with the orders overnight. Mr Baines was previously a central heating engineer but went on to create a machine that makes name tags using technology gleaned from mine excavation. He now exports the technology around the world, with a 3,000-strong client list including companies in Russia and South Africa . Kwiktapes is run from a former high street Lloyds Bank building and employs just four people.